Join the McCracken Sisters for a Trash Mash-Up during this month’s installation of YBCA:ConVerge. 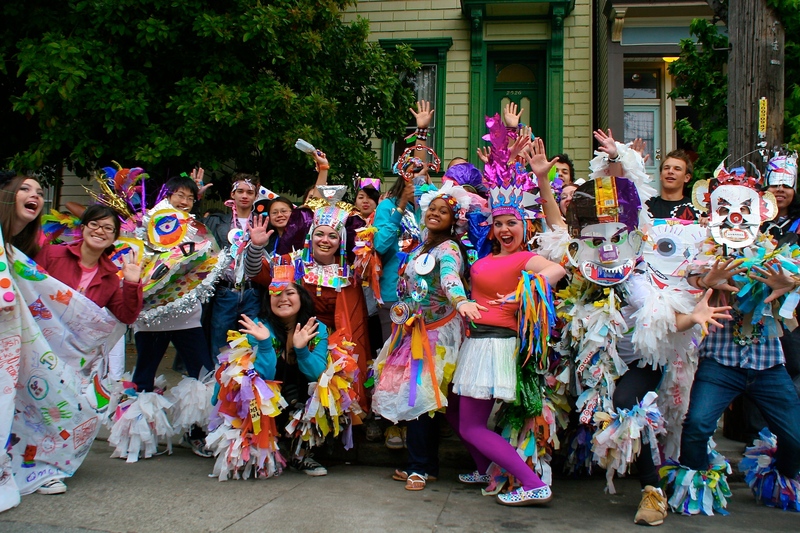 Trash Mash-Up is a community art project based in San Francisco that shares cultural traditions with diverse local communities in public performances and workshops. Create your own trash couture to wear to Project Nunway V on Sat, Nov 2! Also at this event: FACES SF Dancers perform Thriller! Trash Mash-Up has been collaboration with FACES SF dancers and they will perform dance pieces which they have created their costumes with TMU. FACES SF represents the legacy of two of San Francisco’s longstanding non-profits: Florence Crittenton Services and Whitney Young Child Development Center. FACES SF’s Child Development Programs provide full-day licensed, subsidized child care for infants, toddlers, and preschoolers, and half-day (before and after school) enrichment for K-6th graders. YBCA ConVerge is a free monthly public gathering of art, ideas, and people featuring creative and generative social art practices. At ConVerge, the after work hours get infused with a big, loving dose of cutting edge art, innovative people and community!